In the slums of Uganda, Nakku Harriet’s children must sell corn to earn enough money to pay the family rent and to have food to eat. 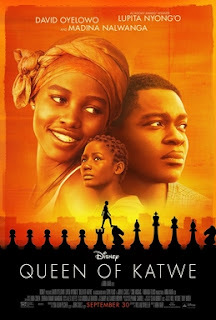 Her teenage daughter Phiona finds a chess ministry run by Robert Katende; she and her siblings are welcomed with warm food, and are able to return home satisfied, leaving enough food for their mother to eat. 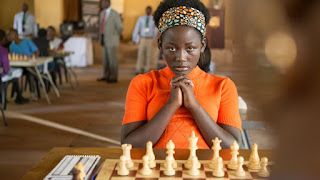 Phiona also finds that she has a natural aptitude for chess; she quickly learns the game and becomes the champion of the youth center. This opens a world of opportunities to Phiona, as she is able to travel to national and international competitions. Robert also agrees to provide a safe home for Phiona and schooling for her siblings. Although Nakku Harriet initially is skeptical, she allows her children to go with Robert and she also supports Phiona’s drive to excel at chess. Phiona’s triumphs are able to lift the fortunes of her family, and the spirits of her village. Although there are no adoptions in the film, Robert serves as somewhat of a parental or mentor figure for the children who come to his chess ministry, and he allows Phiona to stay at his home for a time. Children who have come from difficult places might find Phiona inspiring; much as she exceeded everyone’s expectations and excelled at an international level, so can they. For a moment, Phiona feels the difficulty of adjusting to a new life. A character explains that she can’t always access the new places in her life, and the old places do not feel like they fit her any more. 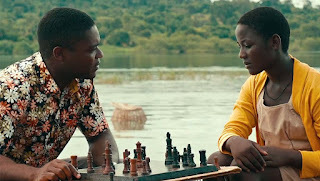 Robert advocates for his children to have the right to participate in regional and international chess tournaments, over the objections of officials who said that they could not have “slum children” at the envents. Robert is wise. He comforts a discouraged child by confiding that, in a very difficult time in his childhood, he wanted to die, but that now he is glad he lived, because he has had many good experiences. 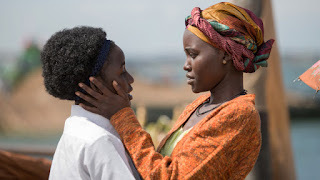 He also encourages a character to grow, saying that “sometimes the place you are used to is not the place you belong.” He also encourages Phiona when she is disappointed by defeat. “Losing,” he assures her, “does not mean failure.” He uses the concept of safe squares in chess to encourage the children in his program to make good choices, and the analogy sticks for them. A child his struck by a vehicle in a hit-and-run accident. His family cannot afford the hospital bill, so they have to leave quickly, without pain medicine. In this situation, they are evicted from their home. Children who remember being without a stable home might find this difficult, and others might be scared or emotionally triggered by the vehicle accident which hospitalizes the child. A mother strikes her adult daughter. It is possible that the young adult daughter is being prostituted; her mother comments on her clothing, and she has a lot of cash in hand on one occasion. 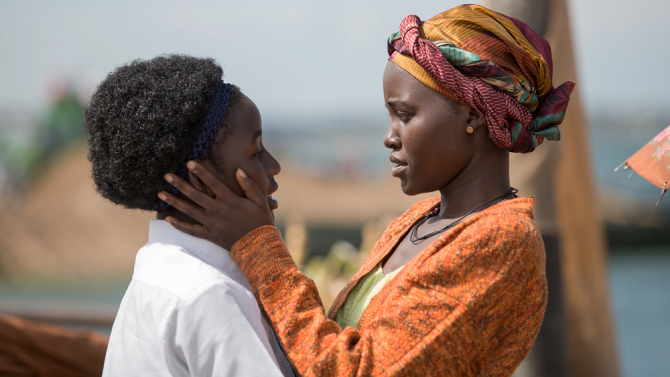 Queen of Katwe is a surprisingly enjoyable, uplifting, relevant, and encouraging film. Between Phiona’s bravery and Robert’s wisdom and kindness, this film has much to offer families. It seems likely to be good for most kids ages 10 and up. A startling hit-and-run scene, a scene of a home flooding, and a possible reference to prostitution might be triggers for some kids, and parents should consider whether those issues are likely to be hard for their kids. That said, this one has my very high recommendation. It's worth seeing! What dreams do you have for yourself? Who has helped you so far? Who might you look to for help to achieve your dreams? In what ways does your background inform your life? In what ways do you determine your own future? When was a time that you learned something good, even though you lost a game? When was a time that you won a game?